wanted to find a school with a competitive sailing team that was a good fit all around. 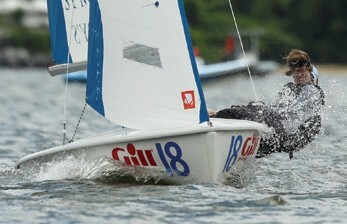 College sailing is unique, with funding being the main difference between Club and Varsity level sailing. Regardless of status, competition is against all other teams in the region. This means a Division 1 team is on the same starting line as a club team. There are no scholarships in college sailing, which helps prevent formal recruitment and promotes a level playing field. So, how does a college team work? Collegiate teams are co-ed and offer races for intermediate to advanced abilities. Races are scheduled on Saturdays and Sundays throughout the fall and spring. Every weekend the team splits up, usually into groups of four or five, which includes an A and B team skipper and crew plus an alternate, to go to different regional regattas. As teams grow, they sign up for more regattas each weekend. On the East Coast, teams race in the host school’s one-design fleet. Just like in high school racing, college sailors do not use a spinnaker or trapeze, so roll-tacking skills are critical. Each sailor learns how to race in many different classes of boats, including keelboats. Teams race primarily in two-person dinghies, most commonly on C420s and FJs (commonly seen with the crew facing aft) but also on MIT Techs (carbon fiber boats with no jib), Larks (roll hard and you’re taking on water), and Fireflies. So, which team should you choose? Schools with a large sailing team go to more races, but only a select few sailors compete in the highest-level regattas. On a small team, each member has a critical role. Larger teams also tend to be run by a full-time coach, while smaller teams are organized by the students with coach input. When you visit a school, make sure to talk to the sailors and try to watch a practice, but choose a college where you feel most comfortable. When it came time to choose a college, I chose a team that was going through a major re-building phase, the University of Connecticut. During my time at UConn, as a skipper and eventually Team Captain, we successfully recruited enough sailors to double our team roster to 30. Our New England conference ranking also improved significantly. After graduation, I put my *cough* five years of college sailing to use and started coaching at SAIL BLACK ROCK in Black Rock, CT. SAIL BLACK ROCK is a combination of the recently restarted Fairfield University Sailing Team and the three-year-old Sacred Heart University Sailing Team. We now have 14 FJs and are based out of Captain’s Cove Seaport in Black Rock Harbor, with both teams are racing independently every single weekend. SAIL BLACK ROCK is hosting our first regatta, The Sacred Heart Invitational, on September 20 & 21. If you are starting to explore college teams, you’re invited to come down to Captain’s Cove to watch the races and meet the sailors and coaches from the 12 New England college teams that will be competing. Jamie Fales is the Technical Race Coach at SAIL BLACK ROCK in Black Rock, CT.